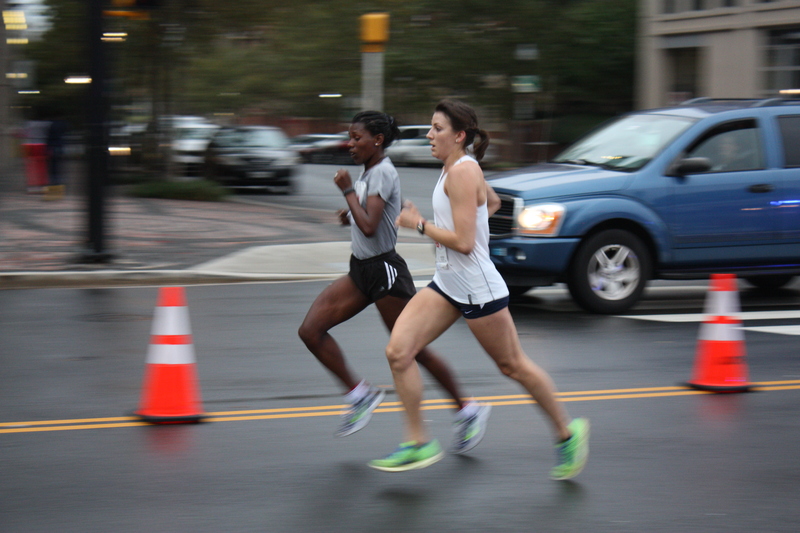 Today is time for another long overdue race recap – Shamrock weekend in Virginia Beach with the Oiselle team. This was such a fun weekend and it was so cool to get to meet so many of the birds in person for the first time, even though I already felt like I knew many of them. Things got off to a bit of a rocky start on my ride down Friday. Traffic was crazy and despite giving myself a two-hour cushion, I made it to the expo with just five minutes to spare. Well before the change deadline, I made the switch from the half to the 8k, which was Saturday morning so this was my only chance to get my bib. I noticed they gave me a half marathon bib anyways and probably should have said something, but I just assumed the chip would still work for the 8k. It did not. I was in and out so quickly I can’t really tell you much about the expo, but I did enjoy race weekend enough that I’d be willing to go back again and find out some more another year! I was really impressed how integrated the hotels seemed to be in the process for race weekend. I stayed about 15 miles from the start in one of the further away hotels, but still immediately upon check-in they said they had a note in their system that I was there for the race. They had an info sheet about shuttles, complimentary wifi, pre-race complimentary breakfast for those running the half/full on Sunday, automatic late check-out and more. Nice work, Holiday Inn – Greenwich. After a few hours sleep I was up bright and early for the race Saturday. Fortunately there was a lot of parking near the race. Naturally I parked more than a mile away since I was nervous about getting closer, not finding a spot and then getting lost. Still it worked out well – and it was free parking. Living near D.C., you don’t see that too often! 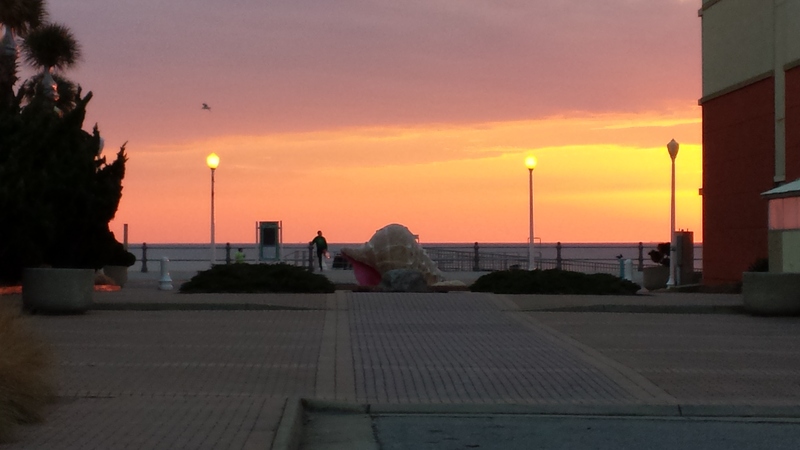 Sunrise on my walk to the start. 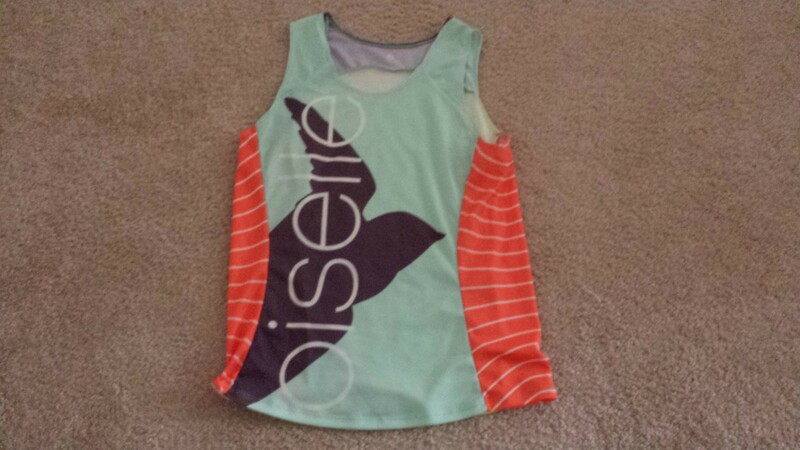 I wore my new Oiselle shimmel tank, fresh green distance shorts and some calf sleeves. I could have used some arm warmers or maybe my lesley knickers instead of the shorts, but other than being chilly for the start, it wasn’t too bad. By chance I bumped into the other birds who were running on Sunday on their shakeout run and was able to say hi before the race. It definitely put a smile on my face before the start. I’d see them again on my way to the finish too! I lined up in corral 2 and went out at a pace I knew I could sustain for the duration. When you’re 7 minutes off a PR in a 5-mile race you know you’re out of shape, but regardless it was still a fun race. The course was mostly flat and fast and featured some great views along the ocean. It could be a rough one if the wind really picked up, but wasn’t too bad that morning. Saturday night we hit up an Italian restaurant for a great team dinner and some fun bonding time – even if Bart Yasso did stand us up! Sunday was another early morning to meet up with Kristin, our team manager, and the other 8k runners to cheer on our teammates running the half. This was a blast and really inspiring – man there are some speedy birds on this team! It is so much fun being a part of this team. They inspire me every day and I love the support system I’ve found in them. 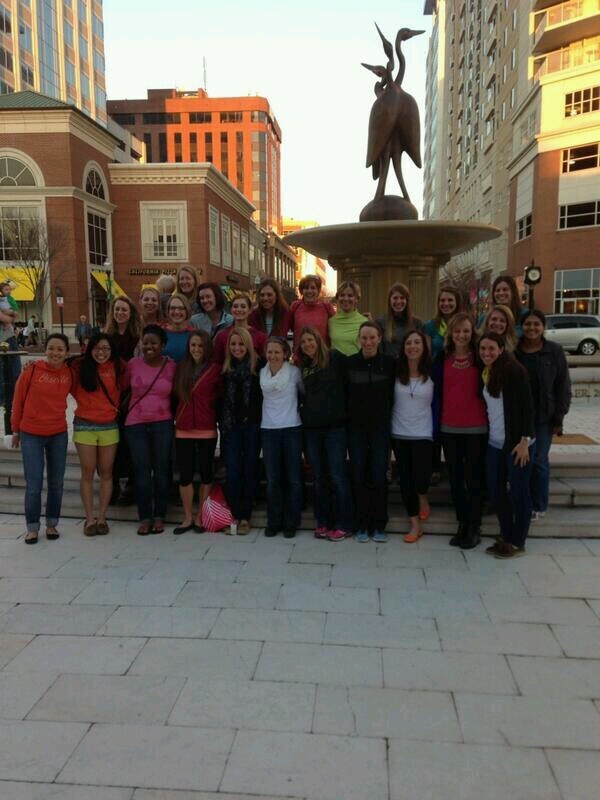 Such an awesome group of women I’m proud to call myself a part of! I set a new 8k PR on Sunday! By a lot. Granted I haven’t run a ton of 8ks, but still, like last weekend’s successful long run, this came at a time in my training where I really needed it providing another confidence boost heading into the Marine Corps Marathon. 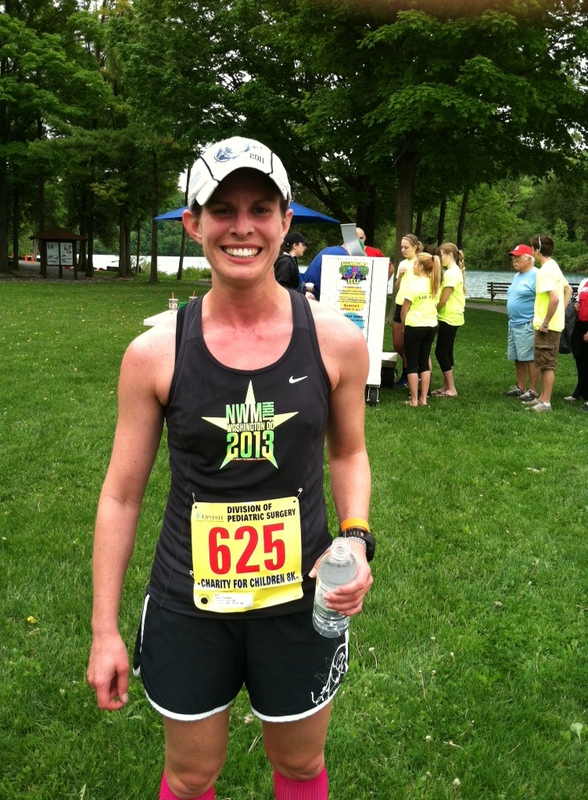 I was looking for an 8 or 10k this weekend at the suggestion of my coach and ended up choosing the Acumen Race for a Cause for a couple reasons. The top reason being proximity. Like the Clarendon Day Double, the start/finish line was walkable from my apartment and the course took me right through my neighborhood. 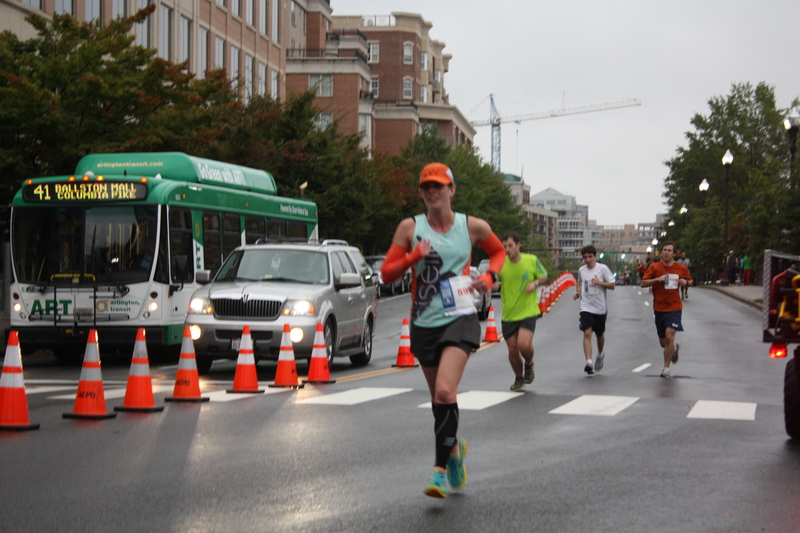 It was also run by Potomac River Runners and they’ve always done a good job with any race I’ve done through them in the past. Finally, it seemed like a really cool concept for a charity race. During the last four years Acumen solution has distributed more than $415,000 and you actually got to choose from a list of ten local nonprofits what charity you wanted your registration fee to support. 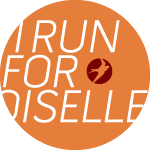 I woke up early Sunday, ate a piece of toast and a banana, and for the second time got to put on my awesome Team Oiselle singlet. Ian grabbed his camera and a rain jacket since it seriously rained nonstop all last week and weekend. Sunday was really just a light drizzle and about 60 degrees, so it was almost pleasant out after the week of downpours. We were out the door at 7 for about a 30-minute walk to the start. I got a great warm-up in and handed over my hoodie to Ian before he headed off to stake out a spot along the course to cheer me on and take some pics. 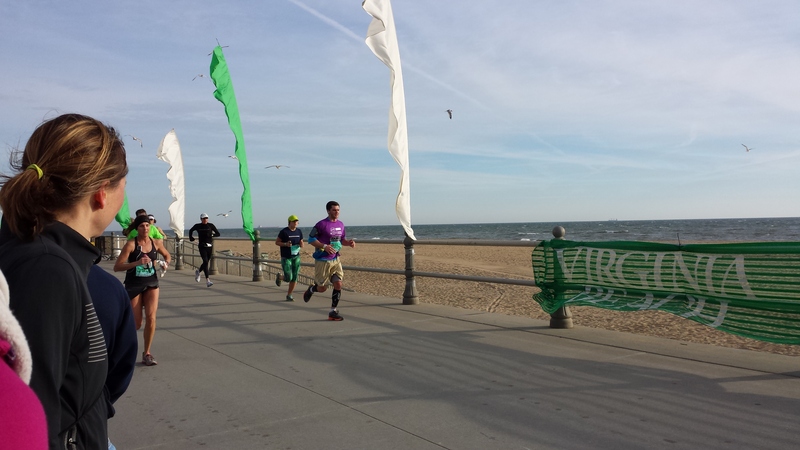 It was a bit windy, but otherwise race conditions looked to be pretty good. Aside from being annoyed with a group of Marymount lacrosse players who showed zero respect during the national anthem, I was in the zone and ready to go. I accidentally hit the start/stop button twice on my garmin when we got going, but noticed about 10-20 seconds in so I was able to start it again and wasn’t too far off. We headed down Quincy Street and quickly onto Wilson Blvd. for the first mile. 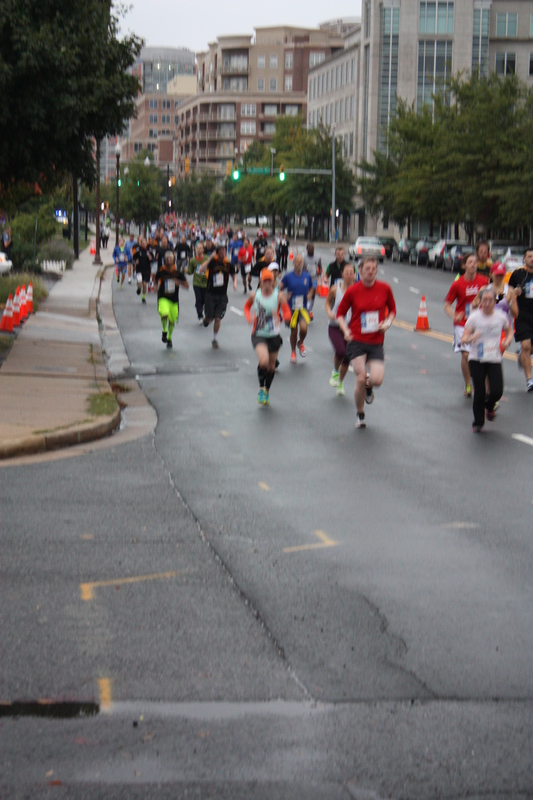 I started relatively close to the front so I was able to run freely without any overcrowding issues. After a turn onto 10th for a quick stretch we spent the bulk of the race on Washington Blvd. There was slight downhill on mile 2 that would haunt me on my way back, but otherwise it was relatively flat/gently rolling through the turnaround at Columbia Pike when we hit the 2.5 mile mark. I went out a bit harder than I planned to running miles 1 and 2 closer to my 5k pace and eased up slightly on mile 3. I felt strong through 3 and then paid for it on 4, especially when I hit that little uphill. 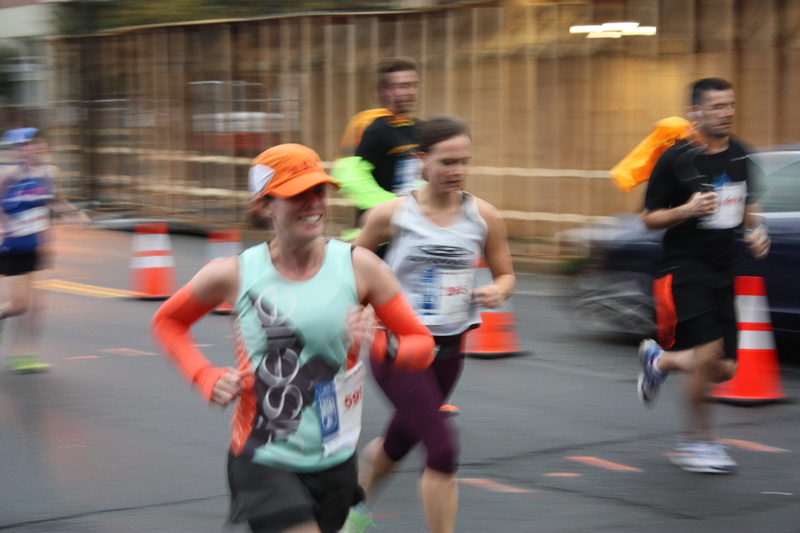 I got a second wind though and ramped it back for mile 5 trying to push for a sub-38 finish. The last mile seemed to fly by and I kicked it into an even higher gear after making the final turn on to Quincy for the last stretch. 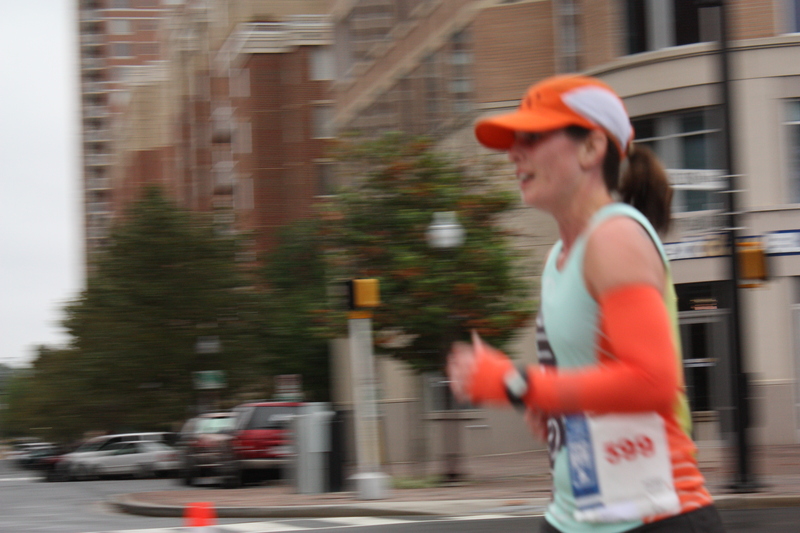 I pushed to the finish line and came oh-so-close to sub-38 crossing the line in 38:03. Roughly 20 seconds a mile faster than my previous 8k PR of 39:42, I was pumped! It was good enough for 7th in my age group and 24th out of 315 women! This was a really well organized, fun, smaller race that I would definitely do again. 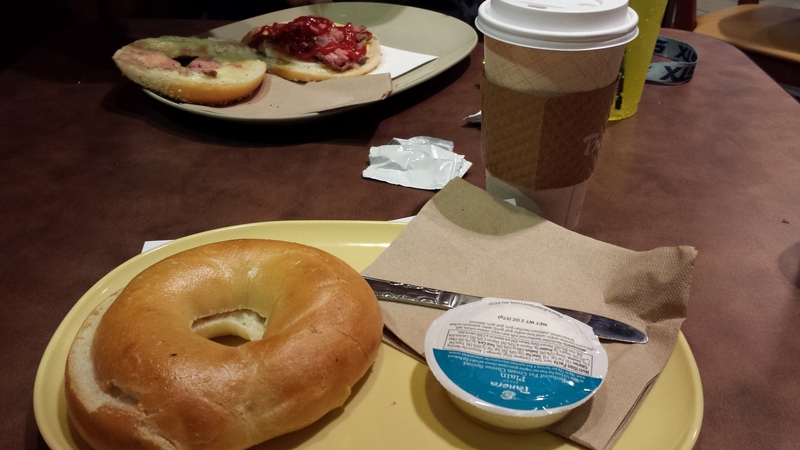 Ian and I walked around the corner to Panera for breakfast before making the trek back home and I enjoyed a bagel with cream cheese and a hot chocolate. Not a bad Sunday morning! How did your weekend racing and running go? I’m a week late with my recap, but Sunday the 19th I ran the Charity for Children 8k at Green Lakes when I was back home for the weekend. I knew going into this that I wasn’t in the kind of shape I needed to be yet to actually race this, but I was looking forward to a challenging 5-mile run and that’s exactly what I got! I’ve become a big fan of smaller races as of late and this fit the bill with just about 500 runners for both the 8k and 5k. Another draw for me for this race was the 10 a.m. start time! I always appreciate a race that doesn’t require me to wake up at the crack of dawn or when it’s still dark out to get to the start line on time. I was also excited to run at Green Lakes. I haven’t run there since I worked there in college years ago, and I was looking forward to taking things off the road since that’s normally the only surface I run on. The 8k and the 5k started at the same time on a narrow beach path so I worked my way near the front of the start line to avoid being boxed in. We looped around the beach and into the woods changing from a concrete path to gravel and then dirt as we ran around Green Lake. I kept myself from going out too fast like the previous week’s 5k and hit the first mile marker in 7:15. As I worked my way past Green Lake and around Round Lake the path changed again to mulch. The different surfaces definitely slowed me down a bit and so did a short, but steep hill on the way to mile three as we came back out onto the beach path past the third mile marker where my Mom was waiting to cheer me on and snap a picture before she headed to the finish line! Miles 2 and 3 came in a bit slower at 7:49 and 8:18. 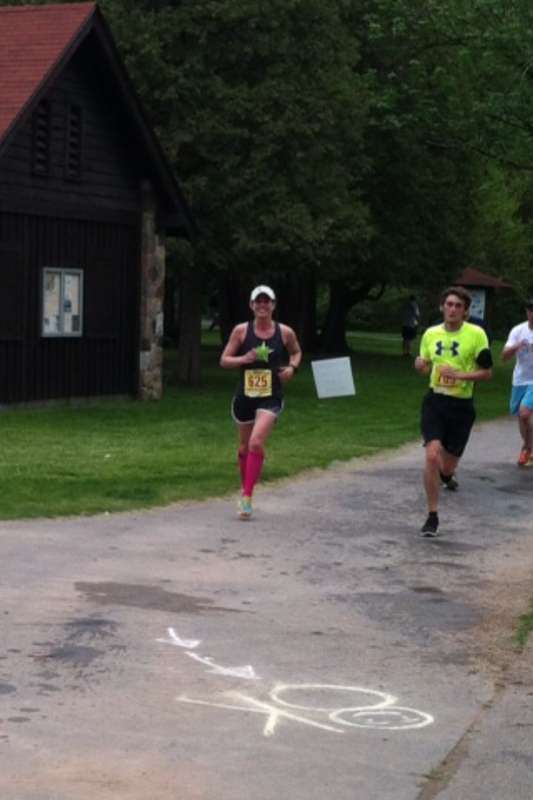 Passing the 3 mile mark at the Green Lakes 8k! After coming back onto the beach path we quickly turned and ran up a path, out of the beach parking lot and on paved roads, up through the campgrounds past the frisbee golf course and to the cabin area. The emphasis on that sentence should be on the word up! Mile 4 was pretty much all up hill… a long steep hill! My pace slowed all the way down to 9:29. I don’t normally drink water in races this short, but I was pretty relieved to see a water stop at the top of the hill at the mile 4 marker. I grabbed a cup as I turned around and started the final mile. We didn’t go straight back the way we came, but I did get to enjoy a downhill to the main road through the park and decided to pick up the pace putting in a 7:04 final mile. 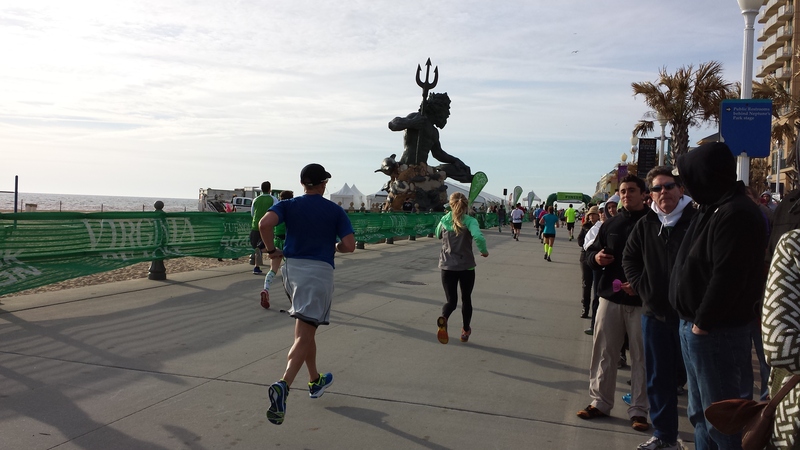 I turned back into the beach parking lot and onto the beach path I started on around to the finish line. I crossed the line in 40 minutes flat according to the official results. My watch had me at 39:57 and even though 3 seconds shouldn’t make a difference especially when it’s not even a PR, it still made me a little upset when I saw I hadn’t officially beaten 40. Regardless, it was a great race. The packet pick up that morning was incredibly quick, the water stops were staffed with great volunteers and the course was really well marked. I had a great run and would love to go back and do it again next year! 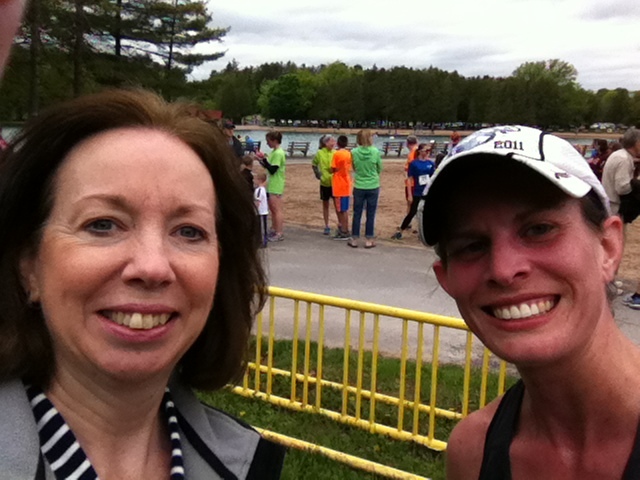 At the finish line with Mom! I do wish I had stuck around longer after the race though – turns out I would have gotten an award! I finished 45th out of 235, was the 8th overall female and 3rd in my age group!